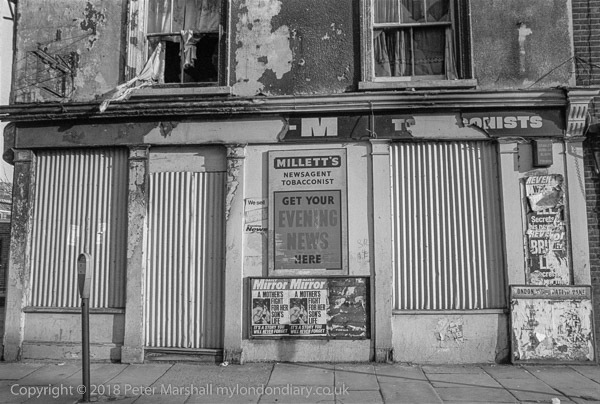 Millett's Newsagent & Tobacconist was at 111 Tyers St Vauxhall close to the Lambeth City Farm. Kenneth Cecil Millett had owned a number of businesses, including "Wash Me Clean" Launderette at 1, Jonothan Street, SEll, a newsagents at 11-13 Stratton Ground, SW1, and newagents and tobacconists like this also at 20 Vauxhall Street, SE11, 50 Trinity Road, SW17, 7 Wilcase Road, SW8, 342 Kennington Lane, SEll and 44-46 Wood Street, Kingston-upon-Thames (also an offlicence) but in 1976 filed for receivership. The shop on the corner of St Ostwald's Place, has now been replaced by a modern 4-storey block of unusual design.